Tonsil enlargement in adults may have intrinsic, unknown, infective or tumor origins. Some tonsils trap tonsilloliths (small concretions that are stone-like). May be aggravated by nose allergies, infections or laryngoesophageal gastric reflux. May result in blocked breathing passages, and snoring and obstructive sleep apnea. Recurrent tonsillitis could be associated with sore throats, fevers, poor feeding, antibiotic resistance and absence from work. Fever, pain and antibiotic medications may be required. Day surgery for tonsils removal may be required for chronic airway obstruction, severe or recurrent tonsillitis. Diathermy, radiofrequency and coblation methods are available. Minor ulcers around 2-8mm diameter may take 2 weeks to heal. Major ulcers which are larger and deeper take longer and can leave scars. The ring of muscle between the esophagus and stomach becomes weak or relaxes abnormally. In Gastroesophageal Reflux Disease (GERD), backflow of the acid/ non-acid eg pepsin contents from the stomach up into the voice box and laryngeal area causes irritation, phlegm and hoarseness in the throat. Obesity, pregnancy, coughing, vomiting, straining or sudden physical exertion can cause increased pressure in the abdomen. Some may have an undiagnosed small hiatal hernia, where a small portion of the stomach is trapped above the diaphragm. LERD may not be associated with gastric pain or heartburn sensation. More often, it is just chronic throat irritation worse after meals or sleep, or hoarseness of voice that prompts an evaluation. 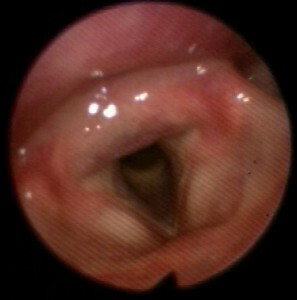 Long term however, there is a risk of cancer change in the esophageal and laryngeal and voice box mucosa if untreated.